Tinted glass is a normal float-clear glass into whose melt colorants are added for tinting and solar-radiation absorption properties. This reduces heat penetration in buildings. Colored glass is an important architectural element for the exterior appearance of façades. 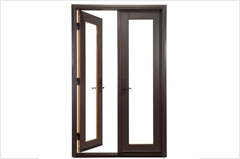 Body-tinted glass is also used in interior decoration. Production is the same as in float glass production. The only variation is the colorants mixed at the beginning with the standard raw materials. Different additives may produce differently colored glasses. Glass is available in a number of tints which absorb a portion of the solar heat and block daylight. Tinting changes the color of the window and can increase visual privacy. The primary uses for tinted glass are reducing glare from the bright outdoors and reducing the amount of solar energy transmitted through the glass. Tinted glazing’s retain their transparency from the inside, although the brightness of the outward view is reduced and the color is changed. The most common colors are neutral gray, bronze, and blue-green, which do not greatly alter the perceived color of the view and tend to blend well with other architectural colors. Tinted glass is made by altering the chemical formulation of the glass with special inorganic additives. The color is durable and does not change over time. Its color and density changes with the thickness of the glass. Coatings can also be applied after manufacture. Every change in color or combination of different glass types affects visible transmittance, solar heat gain coefficient, reflectivity, and other properties. Glass manufacturers list these properties for every color, thickness, and assembly of glass type they produce. Tinted glazing’s are specially formulated to maximize their absorption across some or all of the solar spectrum and are often referred to as heat-absorbing. All of the absorbed solar energy is initially transformed into heat within the glass, thus raising the glass temperature. 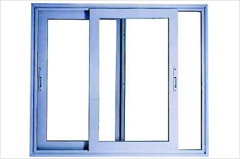 Depending upon climatic conditions, up to 50% of the heat absorbed in a single pane of tinted glass may then be transferred to the inside via radiation and convection. 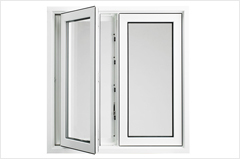 Thus, there may be only a modest reduction in overall solar heat gain compared to other glazing’s. 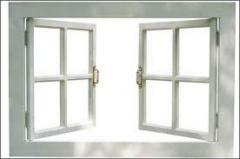 This heat gain from absorption that is transmitted to the room leads to discomfort near tinted windows as well. 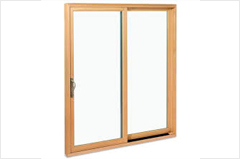 Heat-absorbing glass provides more effective sun control when used as the outer layer of a double-pane window. Traditional tinted glazing, bronze and gray, often force a trade-off between visible light and solar gain. There is a greater reduction in visible transmittance than in solar heat gain coefficient (see figure to the right). 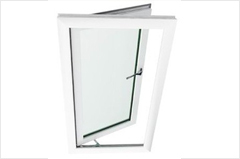 This can decrease glare by reducing the apparent brightness of the glass surface, but it also diminishes the amount of daylight entering the room. For windows where daylighting is desirable, it may be more satisfactory to use a high-performance tint or coating along with other means of controlling glare. Tinted glazings can provide a measure of visual privacy during the day, when they reduce visibility from the outdoors. However, at night the effect is reversed and it is more difficult to see outdoors from the inside, especially if the tint is combined with a reflective coating. To address the problem of reducing daylight with traditional tinted glazing, glass manufacturers have developed high-performance tinted glass that is sometimes referred to as spectrally selective. This glass preferentially transmits the daylight portion of the solar spectrum but absorbs the near-infrared part of sunlight. This is accomplished with special additives during the float glass process. Like other tinted glass, it is durable and can be used in both monolithic and multiple-glazed window applications. Spectrally selective glazings have a light blue or light green tint and have higher visible transmittance values than traditional bronze- or gray-tinted glass, but have lower solar heat gain coefficients. 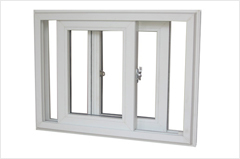 Because they are absorptive, they are best used as the outside glazing in a double-glazed unit. They can also be combined with low-E coatings to enhance their performance further. High-performance tinted glazings provide a substantial improvement over conventional clear, bronze, and gray glass, and a modest improvement over the existing green and blue-green color-tinted glasses that already have some selectivity. 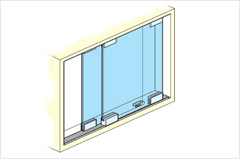 Tinted glazing is more common in commercial windows than in residential windows. In retrofit situations, when windows are not being replaced, tinted plastic film may be applied to the inside surface of the glazing. The applied tinted films provide some reduction in solar gain compared to clear glass but are not as effective as spectrally selective films or reflective glue-on films, and are not as durable as tinted glass.